I’ve just attended the Social Learning conference organized by Open Learning at UNSW. It was a two-day event; I was one of five keynotes and also ran a Learning Design workshop. I was delighted to meet and have the opportunity to talk with the companies Chief Technical Officer, David Collien. It turns out that we have a lot of shared research interests. David described to me the work he has been leading on in terms of Pedagogical Patterns. Patterns work originated in Architecture through the work of Alexander in the late seventies. Alexandra defined 250 patterns for describing and creating building and communities. A pattern is something that addresses a problem and presents a solution. A good starting point to explore patterns work is www.patternlanguages.com. In the mid nineties Gramma, Heln, Johnson and Vlissides applied the concept of patterns to software architecture and developed 23 classic software design patterns. Work in the area of Education is still relatively nascent. Wikipedia has a good site on pedagogical patterns en.m.wikipeddia.org/wiki/pedagogical-patterns. map out a domain of knowledge and practice. The pool room – a very Australian concept, where prizes or trophies are put in the ‘pool room’, the equivalent in a learning context, is that the teacher puts examples of good practice associated with a course in the course ‘pool room’. Three bears – where the students are asked to consider a concept from three perspectives extremes of the concept plus just about right. 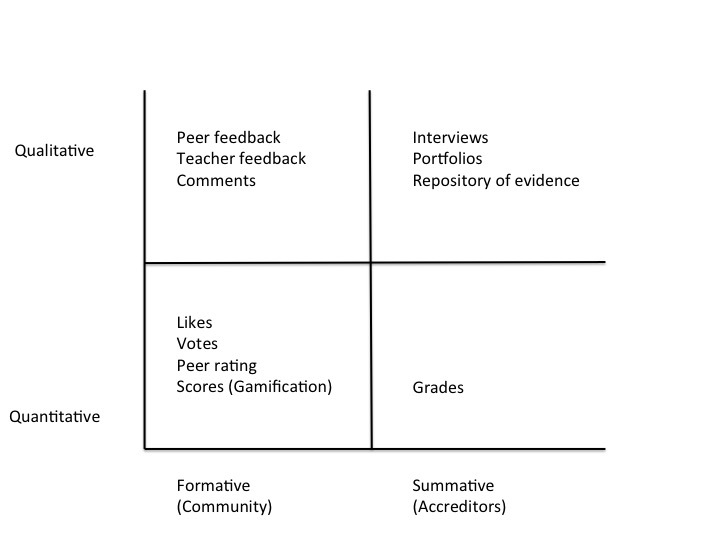 He then shared a useful illustration of different forms of assessment, for each indicating how they mapped to various assessment tools. He argued that design can occur at a number of levels of granularity: Course, Module, and Activity. Ruth Crick and Nancy Law have been doing some interesting work on pedagogical patterns. David said that in due course he will share the resource he has been developing, I look forward to exploring it. This entry was posted on Wednesday, November 29th, 2017 at 11:42 pm	and is filed under General. You can follow any responses to this entry through the RSS 2.0 feed. You can leave a response, or trackback from your own site.